Google does a decent job translating Web pages from other languages, but machine-based translation is still not good enough for when you need a truly accurate translation. 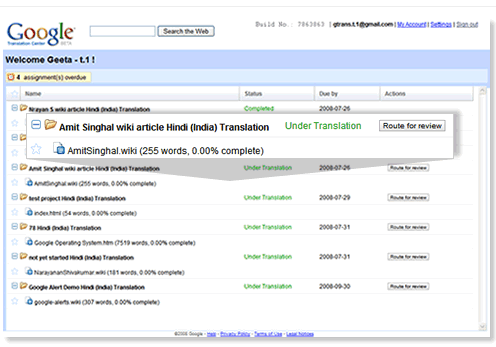 A new service called the Google Translation Center looks like Google is making its machine-translation technologies available to human translators. If you have a document that needs translating, you can upload it and request a translator to work on it, according to the marketing information on the site. (I was unable to actually sign in with my Google account, so this may not have fully launched). The service can accommodate both professional and volunteer translators, and will let them use Google’s automatic translation tools and dictionaries to do their work. This could make translations a lot easier to do because the machine translation tools could take a first pass at the documents, meaning the translator would just have to correct any mistakes instead of starting with a blank screen. The Translation Center is set up as a marketplace for matching translators with people who need texts translated. It supports both paid translations and volunteer ones. In a sense, the system is like Amazon’s Mechanical Turk, in that it finds humans to do work that computers are not yet proficient at. The system also keeps track of previous translations, and matches new ones against its “global Translation Memory.” That makes this project sound like a way for Google to collect a good set of translations to help improve its core translating algorithm, more than as a standalone business. Google Blogoscoped has more details.